I Chicklet, LOVE paper products. Whether it be a funky notepad, a cool birthday card, or one of them fancy stationery sets, I LOVE paper stuff. I love it so much that on occasion, I've been known to stockpile at least four DIFFERENT notepads, all awaiting their grand opportunity to be the CHOSEN one for my purse that month. And that's just for the PURSE! There's also the magnetic FRIDGE notepads, the computer DESK sticky notepads, and the teeny weeny drink-holder-size (for the CAR) notepads. Unfortunately, I must confess... it doesn't end there. I've also been known to stockpile cool CARDS I might use, say, for a birthday, an anniversary, a wedding, and even a baby or two - oh... usually about 6 MONTHS in advance. Cuz when you find GOOD paper products, you must BUY good paper products. Cuz while there are a hell of a lot of stationery STORES out there, IN those stores is a hell of a lot of crap. As such, I point you to my latest purchase. The thank-you cards from OnePunkPosy (on Etsy). While I haven't received them yet, I am absolutely GIDDY waiting for them and am more than confident they'll be an enthusiastic two thumbs up. They're a great size, they're on the PERFECT card stock, and the design? 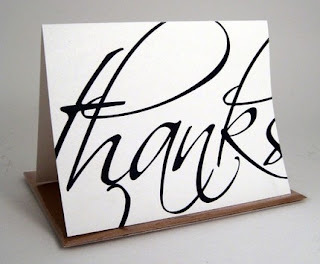 Simple, easy, clean - perfect for ANY kind of thank-you, regardless of the occasion. Oh, and if you're jealous because I bought the last ones, I also bought the Hello Notecards, which I think will be even MORE multi-purpose. And there's still lots left! Count me in as a big fan of paper products--I look at the card/stationary section every time Im in a store that has one--and end up going home with something cool! I think you've turned me on to a new addiction.